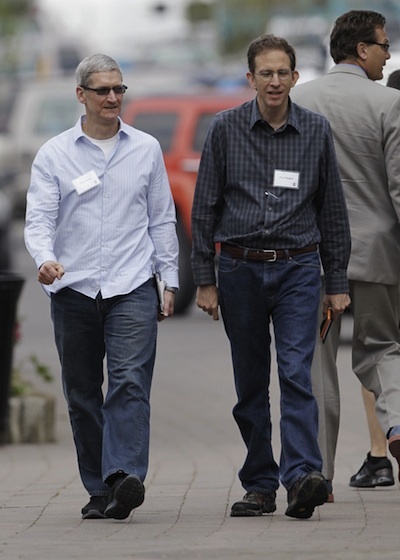 Apple CEO Tim Cook is heading to the prestigious Allen & Co. conference in Sun Valley, Idaho for the second year in a row, according to Reuters. Last year, Cook said he was "looking forward" to meetings with media executives attending the conference. In the past year, Apple has made a number of media-related moves, including launching iTunes Radio, bringing WatchESPN, HBO GO and others to the Apple TV. The company is also rumored to have a deal with to bring The CW to the Apple TV as well. Steve Jobs was occasionally found on the invitation list for the Sun Valley conference, including as late as 2010, but his last appearance at the event came in 2005. I hope he releases iOS, OSX, Mac Mini, Apple TV 4, iWatch, MacBook Pro, Retina MacBook Pro, iMac, Mac Pro, iTV, iPad 5, and iPad Mini 2 at this!! Tim is shorter than I thought. "...a deal with to bring The CW to the Apple TV as well." -not something you'd want to tell anyone. Cook looks very budget. This is marketing for the new lowcost phone. He's 6'3" -- the guy next to him must be a giant. As much as these guys make you would think they would have someone picking out what they should wear. Is it me or is their style just horrible? It's you. And their style is horrible. Tim's height is 6' 3", how exactly tall did you think he was? Trivia: "akamai" means clever or smart or intelligent in Hawaiian. Still used in modern Hawaiian-English slang, e.g. "She one akamai wahine." He's supposed to be 6'3". He just looks shorter walking next to Sagan who is simply taller. And wow, look at that guy with the suit. Must be about 8 feet tall, and he's got three legs.